Calum Elliot scored two and set up another as Hearts hammered Hamilton in a game both sides finished with 10 men. Elliot opened the scoring after six minutes and David Templeton added the second, both from long range. After the break, Hearts' Ruben Palazuelos was shown a second yellow card and Martin Canning was sent off. Kevin Kyle scored from the penalty spot following Canning's foul on Elliot, who minutes later broke clear again to send Accies to a second straight 4-0 loss. Despite the goals and two dismissals, it was never as stormy a game as the one between the sides in December, when five players and the Hearts masseur, Alan Robson, were sent off during and after that match following an ugly tunnel fracas that later saw both clubs fined. But it will come as a bitter blow to Hamilton manager Billy Reid, who had made two changes after the opening-day defeat by Aberdeen, with Joel Thomas making his first start since returning from Colchester. Brian McQueen, who made his first-team debut as a substitute against the same opponents in February, was in the starting line-up for the first time as David Buchanan and Gary McDonald dropped out. McQueen was used in a sweeper role behind Martin Canning and Simon Mensing in an adventurous 3-4-3 formation, but Hearts quickly took advantage of uncertainty in the home rearguard. Ismael Bouzid returned from suspension to partner Marius Zaliukas in central defence, with Darren Barr moving to right back in place of Jason Thomson in the only change for the visitors as Jim Jefferies was again unable to start summer signings Kyle and Stephen Elliott. With Kyle only fit enough for the bench and Elliott still injured, Elliot continued where he left off last weekend, when he scored Hearts' only goal in an otherwise unconvincing home draw with St Johnstone. And the former Scotland Under-21 striker picked up the ball 22 yards out before curling a fine, left-footed drive into the far corner. Hearts were rarely under pressure but were comfortable without posing much of a threat of their own until a catalogue of errors in the Accies defence presented them with a second goal after 24 minutes. Goalkeeper Tomas Cerny failed in his attempt to head clear a panicky scooped pass-back from Mensing to the edge of the six-yard box. Canning gathered wide on the right, but his attempt to hoof the ball to the half-way line eventually fell straight at the feet of Templeton, who held off his marker before giving Cerny little chance with his stinging drive from 18 yards. Jack Ross's nightmare start to his Accies career continued when he was hooked at half-time - a week after conceding two penalties at Pittodrie - with winger Jim McAlister thrown on in place of the former St Mirren wing-back. It had an immediate galvanising effect on the home side, who had a fair shout for a penalty turned down when Flavio Paixao was felled by Wallace's nudge in the back. Hearts broke clear as the referee waved away appeals and Stephen Finnie again refused calls for a spot kick as Wallace was himself challenged by McAlister. Accies were unlucky not to pull a goal back when Flavio Paixao dived to meet a Dougie Imrie cross, but his header from eight yards crashed clear off the underside of the crossbar. Hearts were forced into a re-organisation after 62 minutes, when Palazuelos' high tackle on Flavio Paixao resulted in a second yellow card for the Spaniard. 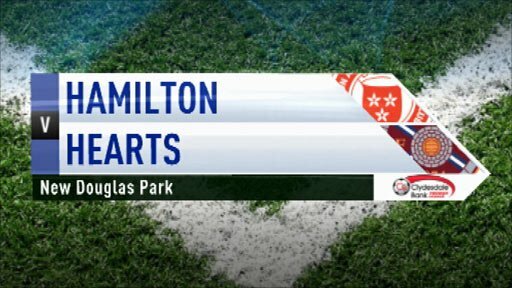 Hamilton failed to make headway in the 12 minutes during which they had a man advantage, Canning being sent off after Elliot collapsed in the box after a lung-busting breakaway from the halfway line. Substitute Kyle blasted the penalty kick into the roof of the net and, five minutes later, Elliot pounced on a mistake by Kyle Wilkie to race clear and stroke the ball in off the far post from 16 yards. There was still time for Cerny to deny Elliot a hat-trick when he acrobatically turned the striker's powerful 16-yard drive over the crossbar. 90:00+3:57 The referee brings the game to a close. 90:00+0:34 Marco Paixao takes a shot. Marian Kello makes a save. 89:35 Craig Thomson takes a inswinging corner. 89:24 Shot by Calum Elliot (Hearts) right-footed from left side of penalty area (12 yards), save (tipped over) by Tomas Cerny (Hamilton). 88:19 Foul by Gavin Skelton (Hamilton) on Kevin Kyle (Hearts). Direct free kick taken right-footed by Ismael Bouzid (Hearts) from own half, resulting in open play. 88:05 Defending throw-in by Darren Barr (Hearts). 87:39 Attacking throw-in by Joel Thomas (Hamilton). 85:47 Outswinging corner from right by-line taken right-footed by Craig Thomson (Hearts) to far post, save (caught) by Tomas Cerny (Hamilton). 85:34 Attacking throw-in by Darren Barr (Hearts). 85:27 Attacking throw-in by Darren Barr (Hearts). 85:14 Attacking throw-in by Craig Thomson (Hearts). 84:42 Goal kick taken long by Tomas Cerny (Hamilton). 84:35 Header by Kevin Kyle (Hearts) from centre of penalty area (12 yards), missed right. 83:44 Goal kick taken short by Tomas Cerny (Hamilton). 83:03 Foul by Joel Thomas on Craig Thomson, free kick awarded. Marian Kello takes the direct free kick. 80:54 GOAL - Calum Elliot:Hamilton 0 - 4 Hearts Goal by Calum Elliot (Hearts) right-footed (bottom-left of goal) from right side of penalty area (12 yards).Hamilton 0-4 Hearts. 80:22 Defending throw-in by Douglas Imrie (Hamilton). 79:33 The referee blows for offside. Marian Kello takes the direct free kick. 78:15 Attacking throw-in by Lee Wallace (Hearts). 78:06 Goal kick taken long by Marian Kello (Hearts). 77:26 Substitution Ryan McGowan on for Ian Black. 76:20 Lee Wallace concedes a free kick for a foul on Kyle Wilkie. Gavin Skelton takes the free kick. 75:35 Assist by Calum Elliot. 75:35 GOAL - Kevin Kyle:Hamilton 0 - 3 Hearts Kevin Kyle scores a power penalty. Hamilton 0-3 Hearts. 74:36 Sent off Red card for Martin Canning. 74:29 Foul by Martin Canning on Calum Elliot, Penalty awarded. 73:23 Defending throw-in by Douglas Imrie (Hamilton). 72:59 Corner from right by-line taken short right-footed by Marco Paixao (Hamilton). 72:20 Inswinging corner from left by-line taken right-footed by Marco Paixao (Hamilton) to centre, clearance by Marius Zaliukas (Hearts). 72:03 Attacking throw-in by Douglas Imrie (Hamilton). 70:56 Goal kick taken short by Tomas Cerny (Hamilton). 70:09 Foul by Martin Canning (Hamilton) on Kevin Kyle (Hearts). Direct free kick taken right-footed by Craig Thomson (Hearts) from left channel, header by Kevin Kyle (Hearts) from centre of penalty area (12 yards), missed left. 69:46 Goal kick taken long by Marian Kello (Hearts). 68:54 Goal kick taken short by Tomas Cerny (Hamilton). 67:31 The free kick is swung in right-footed by Craig Thomson. 67:31 Substitution Suso Santana goes off and Kevin Kyle comes on. 67:31 Free kick awarded for an unfair challenge on Suso Santana by Flavio Paixao. 65:56 Foul by Gary McDonald on Marius Zaliukas, free kick awarded. Free kick taken by Ismael Bouzid. 64:53 Defending throw-in by Martin Canning (Hamilton). 64:29 Substitution Hamilton substitution: Brian McQueen replaced by Gary McDonald (tactical). 63:28 Substitution Hearts substitution: David Templeton replaced by Adrian Mrowiec (tactical). 62:00 Direct free kick taken right-footed by Martin Canning (Hamilton) from right channel, resulting in open play. 62:00 Sent off Ruben Palazuelos (Hearts) dismissed for second bookable offence. 62:00 Foul by Ruben Palazuelos (Hearts) on Flavio Paixao (Hamilton). 61:20 Free kick awarded for an unfair challenge on Lee Wallace by Flavio Paixao. Marian Kello takes the free kick. 58:31 Attacking throw-in by Darren Barr (Hearts). 56:10 Ismael Bouzid gives away a free kick for an unfair challenge on Joel Thomas. Douglas Imrie takes the free kick. 55:20 Attacking throw-in by Douglas Imrie (Hamilton). 55:08 Attacking throw-in by Marco Paixao (Hamilton). 54:30 Goal kick taken long by Tomas Cerny (Hamilton). 53:42 Inswinging corner from left by-line taken right-footed by Craig Thomson (Hearts) to centre, shot by Suso Santana (Hearts) right-footed from centre of penalty area (12 yards), over the bar. 53:28 Attacking throw-in by Lee Wallace (Hearts). 53:16 Defending throw-in by Martin Canning (Hamilton). 52:47 Defending throw-in by Darren Barr (Hearts). 50:37 Goal kick taken long by Marian Kello (Hearts). 50:02 Defending throw-in by Lee Wallace (Hearts). 49:36 Suso Santana (Hearts) caught offside. Indirect free kick taken left-footed by Tomas Cerny (Hamilton) from own half, resulting in open play. 49:05 Goal kick taken long by Marian Kello (Hearts). 48:32 Header by Flavio Paixao (Hamilton) from right side of six-yard box (6 yards), hit bar. 47:53 The referee blows for offside. Martin Canning restarts play with the free kick. 46:18 Corner from left by-line taken short right-footed by Marco Paixao (Hamilton). 45:53 Defending throw-in by Martin Canning (Hamilton). 45:22 Attacking throw-in by Gavin Skelton (Hamilton). 45:01 Substitution James McAlister replaces Jack Ross. 45:00+1:01 It is the end of the first-half. 44:54 Defending throw-in by Darren Barr (Hearts). 44:13 Attacking throw-in by Darren Barr (Hearts). 43:36 Brian McQueen gives away a free kick for an unfair challenge on Calum Elliot. Free kick taken by Ismael Bouzid. 43:05 Attacking throw-in by Douglas Imrie (Hamilton). 42:03 Outswinging corner taken by Craig Thomson, Tomas Cerny makes a save. 40:54 Defending throw-in by Darren Barr (Hearts). 40:25 Attacking throw-in by Douglas Imrie (Hamilton). 40:04 Defending throw-in by Jack Ross (Hamilton). 39:14 Goal kick taken long by Marian Kello (Hearts). 38:48 Attacking throw-in by Douglas Imrie (Hamilton). 38:30 Attacking throw-in by Douglas Imrie (Hamilton). 38:11 Attacking throw-in by Douglas Imrie (Hamilton). 37:56 Attacking throw-in by Gavin Skelton (Hamilton). 37:23 Defending throw-in by Lee Wallace (Hearts). 36:56 Free kick awarded for an unfair challenge on Flavio Paixao by Lee Wallace. Direct free kick taken by Martin Canning. 36:13 Attacking throw-in by Simon Mensing (Hamilton). 35:47 Goal kick taken long by Marian Kello (Hearts). 34:10 Corner taken by Marco Paixao, save by Marian Kello. 33:31 Attacking throw-in by Martin Canning (Hamilton). 32:58 Foul by Calum Elliot (Hearts) on Douglas Imrie (Hamilton). Free kick crossed right-footed by Simon Mensing (Hamilton) from left wing, resulting in open play. 32:28 Free kick awarded for an unfair challenge on Joel Thomas by Ruben Palazuelos. Direct free kick taken by Gavin Skelton. 31:48 Foul by Marco Paixao (Hamilton) on Ian Black (Hearts). Direct free kick taken right-footed by Marian Kello (Hearts) from own half, resulting in open play. 31:24 Attacking throw-in by Jack Ross (Hamilton). 30:48 Defending throw-in by Darren Barr (Hearts). 30:10 Craig Thomson takes a short corner. 30:02 Attacking throw-in by Darren Barr (Hearts). 29:21 Inswinging corner from left by-line taken right-footed by Craig Thomson (Hearts) to centre, clearance by Jack Ross (Hamilton). 28:23 Simon Mensing restarts play with the free kick. 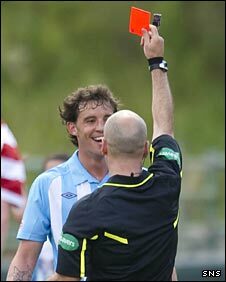 28:23 Booking Craig Thomson goes into the book. 28:08 Unfair challenge on Douglas Imrie by Craig Thomson results in a free kick. 27:37 Defending throw-in by Lee Wallace (Hearts). 27:07 Attacking throw-in by Simon Mensing (Hamilton). 26:35 Goal kick taken short by Tomas Cerny (Hamilton). 23:03 GOAL - David Templeton:Hamilton 0 - 2 Hearts Goal by David Templeton (Hearts) right-footed (top-right of goal) from left channel (20 yards).Hamilton 0-2 Hearts. 22:23 Defending throw-in by Darren Barr (Hearts). 22:00 Attacking throw-in by Douglas Imrie (Hamilton). 21:32 Corner from right by-line taken by Gavin Skelton. 20:35 Attacking throw-in by Martin Canning (Hamilton). 18:16 Foul by Marco Paixao (Hamilton) on Darren Barr (Hearts). Direct free kick taken right-footed by Marian Kello (Hearts) from own half, resulting in open play. 17:05 Goal kick taken long by Tomas Cerny (Hamilton). 16:15 Free kick awarded for a foul by Flavio Paixao on Lee Wallace. The ball is swung over by Craig Thomson, Header on goal by Ismael Bouzid from inside the box goes harmlessly over the target. 15:35 Attacking throw-in by Darren Barr (Hearts). 14:53 Goal kick taken long by Marian Kello (Hearts). 14:40 Attacking throw-in by Flavio Paixao (Hamilton). 14:36 Attacking throw-in by Martin Canning (Hamilton). 14:11 Defending throw-in by Lee Wallace (Hearts). 13:42 Inswinging corner from left by-line taken right-footed by Marco Paixao (Hamilton) to far post, resulting in ball out of play. 12:57 Foul by David Templeton (Hearts) on Gavin Skelton (Hamilton). Direct free kick taken right-footed by Martin Canning (Hamilton) from own half, resulting in open play. 12:28 Defending throw-in by Lee Wallace (Hearts). 12:16 Defending throw-in by Martin Canning (Hamilton). 11:48 Attacking throw-in by Lee Wallace (Hearts). 11:26 Attacking throw-in by Jack Ross (Hamilton). 11:00 Defending throw-in by Flavio Paixao (Hamilton). 10:30 Defending throw-in by Darren Barr (Hearts). 9:55 Foul by Craig Thomson (Hearts) on Douglas Imrie (Hamilton). Direct free kick taken left-footed by Gavin Skelton (Hamilton) from left wing, passed. 9:25 Defending throw-in by Darren Barr (Hearts). 8:07 Simon Mensing takes the direct free kick. 8:07 Booking Ruben Palazuelos receives a yellow card. 7:54 Foul by Darren Barr on Marco Paixao, free kick awarded. 7:49 Defending throw-in by Simon Mensing (Hamilton). 7:29 Attacking throw-in by Darren Barr (Hearts). 6:54 Defending throw-in by Lee Wallace (Hearts). 6:00 Assist (pass) by Suso Santana (Hearts) from right channel. 6:00 GOAL - Calum Elliot:Hamilton 0 - 1 Hearts Goal by Calum Elliot (Hearts) left-footed (top-left of goal) from right channel (18 yards).Hamilton 0-1 Hearts. 5:22 Joel Thomas is ruled offside. Marius Zaliukas restarts play with the free kick. 4:52 Defending throw-in by Lee Wallace (Hearts). 3:52 Free kick taken by Marian Kello. 3:52 Booking Joel Thomas is shown a yellow card for unsporting behaviour. 3:37 Foul by Joel Thomas on Ismael Bouzid, free kick awarded. 3:20 Foul by Lee Wallace (Hearts) on Flavio Paixao (Hamilton). Direct free kick taken right-footed by Martin Canning (Hamilton) from own half, resulting in open play. 3:13 Defending throw-in by Martin Canning (Hamilton). 2:37 Foul by Gavin Skelton (Hamilton) on Ian Black (Hearts). Free kick crossed right-footed by Craig Thomson (Hearts) from right wing, resulting in ball out of play. 1:47 Defending throw-in by Martin Canning (Hamilton). 1:24 Defending throw-in by Martin Canning (Hamilton). 0:39 Inswinging corner from left by-line taken right-footed by Marco Paixao (Hamilton) to centre, foul by Brian McQueen (Hamilton) on Marian Kello (Hearts). Direct free kick taken right-footed by Marian Kello (Hearts) from own half, resulting in open play.